Excessive amounts of the herbicide glyphosate are incorporated daily to the soil and the ecosystems. AMPA is its major environmental breakdown product. In this study we determined the levels of thiobarbituric acid reactive substances (TBARs); quantified superoxide dismutase (SOD) and catalase (CAT) activity in liver, kidney, lung and heart, and performed the comet assay in blood and liver of mice administered glyphosate (40 or 400 mg/kg/day) or AMPA (100 mg/kg/day) in drinking water for 14 days. Exposure to glyphosate 400 mg/kg induced a statistically significant (p <0.05) decrease of SOD activity in heart and an increase in CAT activity in kidney. In the comet assay there were statistically significant differences in all the treatments and tissues studied in comparison to control animals (p= 0.01). The major results of this study were that mice administered glyphosate or AMPA in drinking water for 14 days induced a significant increase in DNA damage in liver and blood but minor effects on oxidative stress parameters. DNA effects on liver and blood indicate that these compounds could be of concern in terms of their potential to damage the genetic material, and that oxidative stress does not seem to be the mechanism causing that effect. Key words: Pesticides; Mice; Genotoxicity. Cantidades excesivas del herbicida glifosato son incorporadas diariamente a los suelos y a los ecosistemas. Su principal metabolito ambiental es el ácido amino-metil-fosfónico (AMPA). En el presente estudio se determinaron los niveles de sustancias reactivas al ácido tiobarbitúrico (TBARs), se cuantificaron las actividades de superóxido dismutasa (SOD) y catalasa (CAT) en hígado, riñón, pulmón y corazón, y se realizó el ensayo cometa en sangre e hígado de ratones expuestos a glifosato (40 o 400 mg/kg/día) o AMPA (100 mg/kg/día) durante 14 días en el agua de bebida. La exposición a glifosato 400 mg/Kg indujo un descenso estadísticamente significativo (p <0,05) en la actividad SOD en corazón y un aumento de la actividad CAT en riñón. En el ensayo cometa se observaron diferencias estadísticamente significativas en todos los tratamientos y tejidos estudiados en comparación con los animales controles (p= 0,01). Los resultados principales de este estudio son que los ratones expuestos a glifosato o AMPA en el agua de bebida durante 14 días presentaron un incremento significativo en los niveles de daño al ADN en hígado y sangre, y efectos menores en los parámetros de estrés oxidativo. Los efectos sobre el ADN indican que estos compuestos podrían ser de preocupación en términos de su potencialidad para dañar el material genético, y que el estrés oxidativo no parece ser el mecanismo que conduce a ese daño. Palabras clave: Pesticidas; Ratones; Genotoxicidad. Glyphosate is the active ingredient of a broad spectrum, non-selective systemic herbicide, used in post-emergence treatments to control annual and/or perennials weeds in agriculture, forestry and landscape environments (Malik et al., 1989; Williams et al., 2000). Regulatory agencies have carried out reviews on the safety of glyphosate used in its different commercial formulations and they had concluded that there is no indication of human health concern (EPA, 1993; WHO, 1994). However, other independent and recent reports indicate that both the herbicide and its metabolite AMPA would not be as safe as originally stated (Iserning, 2004; Çağlar and Kolankaya, 2008). It has been shown that glyphosate is able to induce genotoxic (Li and Long, 1988; Rank et al., 1993; Van de Waart et al., 1995; Bolognesi et al., 1997; Kier et al., 1997; Lioi et al., 1998a; Monroy et al., 2005) and/or oxidative damage (Lioi et al., 1998b. ; Pieniazek, et al., 2004; Beuret et al., 2005; Gehin et al., 2005) in vitro and in vivo. Genotoxic evaluations include increase in micronuclei, sister chromatid exchanges and DNA damage (Vigfusson et al., 1980; Bolognesi et al.,1997; Clements et al., 1997; Lioi et al., 1998a, 1998b; Siviková and Dianovský, 2005; Mañas et al., 2006; Poletta et al., 2008; Mañas et al., 2009b). Aerobic and anaerobic environmental degradation of the parental molecule originates at least six metabolites, being the amino methyl phosphonic acid (AMPA), the major one (Forlani et al., 1999). The AMPA and glyphosate half-life in the soil ranges from 76 to 240 days and from 2 to 97 days, respectively (Battaglin et al., 2005). In addition to the greater soil persistence of AMPA when compared with that of glyphosate, there is evidence indicating that AMPA can cause groundwater contamination (Botta et al., 2009). A scarce number of studies points out to the genotoxic effects of AMPA (Mañas et al., 2009a). Moreover, in very few of these studies the sub-chronic oral exposure to glyphosate have been evaluated (Benedetti et al., 2004; Dallegrave et al., 2007; Çağlar and Kolankaya, 2008). The overproduction of reactive oxygen species (ROS) can be implicated in DNA damage. As a result of the ROS attack to the DNA, permanent changes in the genetic material are the first step in the processes of mutagenesis, carcinogenesis and aging. ROS can cause single and double strand DNA breaks, crossovers and changes in purines, pyrimidines, or deoxyribose (Beuret et al., 2005; Astiz et al., 2009). Also, it was informed that pesticides can induce oxidative stress through the generation of ROS and/or alteration in antioxidant enzyme systems. Therefore, ROS could be involved in the toxicity of glyphosate-based pesticides (Gehin et al., 2005). Because of the discrepancies and even opposite results reported in the literature regarding the potential risks to human and animal health and to the environment posed by the use of glyphosate-based herbicides, it is important to evaluate the effects of glyphosate and AMPA as potential inducers of oxidative stress and genotoxic damage in mammalian tissues. In the present study we evaluated oxidative stress and genotoxicity of glyphosate and AMPA in mice, administered in drinking water for 14 days. To accomplish this goal we determined Thiobarbituric acid reactive substances (TBARs) and quantified superoxide dismutase (SOD) and catalase (CAT) activity in liver, kidney, heart and lung. The evaluation of the genotoxic potential of glyphosate and AMPA was performed in the same animals by the comet assay in peripheral blood and liver. Analytical grade glyphosate [N-(phosphonomethyl) glycine], CAS 1071-83-6 (96%), and analytical grade AMPA, CAS 1066-51-9 (99%) were purchased from Sigma-Aldrich, Argentina. Normal melting point agarose (NMP) and low melting point agarose (LMP) were acquired from Promega, Argentina. All other chemicals and solvents used in this study were of analytical grade. We used 24 Balb C mice approximately 45 days of age from the animal facility of the Faculty of Agronomy and Veterinary Medicine, National University of Río Cuarto. Four groups of six animals each (a control group, two groups treated with glyphosate and a group exposed to AMPA) were used for TBARs, SOD and CAT determinations and the comet assay. They were housed in pairs in 12 plastic cages with food and water ad libitum. During a period of acclimation of seven days prior to the beginning of the experience, we measured the volume of water ingested per day, every two animals per cage, in order to determine the concentration of the solutions of glyphosate and AMPA to be supplied to each group. Mice exposed to the herbicide and its metabolite received approximately 40 or 400 mg/kg/day of glyphosate (G40 and G400 groups) and 100 mg/kg/day of AMPA (A100 group), both compounds were provided orally (p.o.) via drinking water. The doses selected were similar to those employed by other authors in toxicology (including genotoxicology) and toxicokinetics studies (Rank et al., 1993; Bolognesi et al., 1997; Benedetti et al., 2004; Dallegrave et al., 2007; Çağlar and Kolankaya, 2008; Mañas et al., 2009a and 2009b; Anadon et al., 2009). The solutions were freshly prepared every two days and the volume of water ingested per day was measured through the trial. Glyphosate and AMPA were dissolved in sterile fresh water, and pH was adjusted to 7.2-7.4 with 0.1 M NaOH. The control group received only the aqueous vehicle. After a period of 14 days from the beginning of the experiment, peripheral blood was drawn from the tail vein to perform the comet assay. Subsequently the animals were euthanized by cervical dislocation; the dissection and removal of organs (heart, lungs, liver, and kidneys) was carried out for oxidative stress determinations (TBARs, SOD and CAT). These tissues were frozen immediately at -80 ºC until analysis. Part of the liver tissue was immediately homogenized with phosphate buffer (pH 7.4) to perform the comet assay. All determinations were performed by triplicate. The protocol followed the general guidelines proposed by Singh et al. (1988), with minor modifications. The slides were fixed in absolute ethanol, stained with ethidium bromide, and scored using fluorescence microscopy. Images of 100 "nucleoids" counted for each animal were captured with a camera attached to the fluorescence microscope and linked to the Comet Score 1.5 software. Tail moment (TM), percentage of DNA in tail (% of DNA) and tail length (TL) were used to estimate DNA damage (arbitrary units). Tissue homogenates (10%) were prepared in chilled 0.05M potassium phosphate buffer, pH 7.4. TBARs concentrations, expressed as nmol of malondialdehyde (MDA)/g of tissue, were measured by a spectrophotometer at 532 nm in liver and kidney homogenates using the method of Marcinčák et al. (2003). TBARs concentrations were determined using a standard curve at different concentrations of MDA versus optical density, individually prepared for each tissue. Superoxide dismutase activity was assessed spectrophotometrically in the supernatant of liver homogenates according to the method of Misra and Fridovich (1972). One unit of enzymatic activity has been defined as the amount of enzyme capable of causing 50% inhibition of auto-oxidation of epinephrine. Catalase activity was measured at 240 nm by the decomposition of the H2O2 as described by Glick (1954). Statistical analysis was performed using Prism software (PRISM, 1997). The Kolmogorov-Smirnov test was performed to verify if the results follow a normal distribution. ANOVA followed by Dunnet test, or Kruskal-Wallis followed by Dunns test were performed for data with and without normal distribution respectively. The volume of water ingested per animal/day did not show statistically significant differences (ANOVA, p>0.05) among the experimental groups throughout the experiment (14 days) (data not shown). The results of the TBARs, SOD and CAT determinations in tissues of mice after 14 days of drinking water with glyphosate 40 and 400 mg/kg/day and AMPA 100 mg/kg/day are shown in Figure 1. Concentrations of MDA/ g of tissue from the animals of the control group were 4.57 ± 3.06 nmols/ g liver, 17.57 ± 4.20 nmols/ g kidney, 5.04 ± 3.60 nmols/ g lung and 18.34 ± 11.40 nmols/ g heart. There were no statistically significant differences in the concentrations of MDA/ g of tissue among the control, G40, G400 and A100 groups. SOD activity in the animals of the control group was 173.40 ± 18.32 units/ g liver, 400.20 ± 51.00 units/ g kidney, 235.60 ± 69.35 units/ g lung and 213.00 ± 50.70 units/ g heart. There were statistically significant differences in SOD activity in heart in the G400 group (p < 0.05). SOD activity was lower in heart in the G400 group (102.50 ± 46.42), compared with that in the other treatments (p < 0.05). CAT activity in the animals of the control group was 34.37 ± 7.04 nmols/ g liver, 13.48 ± 4.89 nmols/ g kidney, 73.40 ± 30.28 nmols/ g lung and 28.69 ± 10.13 nmols/ g heart. There were statistically significant differences in CAT activity in kidney in the G400 group (33.21 ± 14.83). The results for the comet assay in peripheral blood and liver of Balb C mice are shown in Table 1. 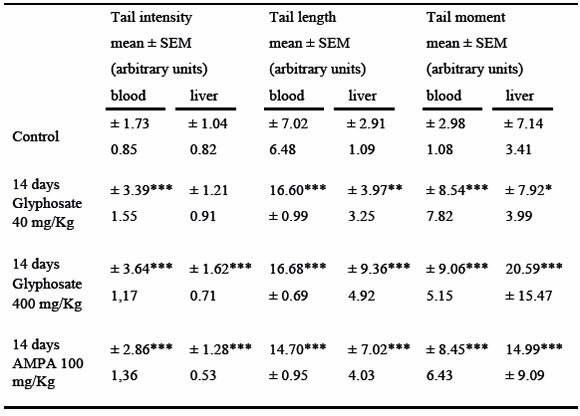 Statistically significant differences in tail intensity, length and moment were found between each treatment and the control group (p< 0.0001, Dunn's test), except in liver tissue in the G40 treatment (p< 0.05 and p< 0.001 in tail moment and tail length parameters). Figure 1. Changes in the levels of TBARs, SOD and CAT activity in liver, kidney, lung and heart in mice administered Glyphosate or AMPA in drinking water during 14 days. n= 6 animals per group. p< 0.01 respect to the control, Dunn test. G: glyphosate, A: AMPA. Each determination was performed by triplicate. Table 1. Comet assay in blood and liver of mice administered Glyphosate or AMPA in drinking water during 14 days. n= 6 animals per group. *p< 0.05, **p< 0.001, ***p< 0.0001 respect to the control, Dunn test. The presence of glyphosate or AMPA in drinking water did not affect its consumption in the volume of water ingested as no statistically significant differences were determined among the groups throughout the 14 days of the trial. In the studied doses of the herbicide and its metabolite and in the four tested organs (liver, kidney, lung and heart), statistically significant differences in oxidative activity were only observed in G400 treatment. In animals that ingested glyphosate at a concentration of 400 mg/kg in drinking water for 14 days, SOD activity (units/ g tissue) decreased in kidney, lung and heart, although it was only statistically significant in heart (102. 50 ± 46.42* SOD units/ g tissue). On the other hand, CAT activity increased in the same organs but it was statistically significant only in kidney (33.21 ± 14.83 * CAT nmols/ g tissue). A decreased in SOD activity with an interesting biological significance was also observed in all organs of animals administered with AMPA100 mg/kg in drinking water, but without statistically differences; CAT activity showed no variation in this treatment. As it was presented, the activity in CAT enzyme significantly increased in the G400 group, but did not change in the G40 group, except for an increase in lung. Liver was the only organ that did not present any type of variations, neither in TBA reactive substances nor in SOD and CAT activity This suggests a better oxidative balance in this organ in a subchronic design since earlier studies on oxidative stress have shown that the levels of CAT increased in liver of mice treated with glyphosate intraperitoneally (ip) at a dose of 400 mg/kg (Mañas et al., 2009b) within 1 h after a single ip administration. However, at 14 days oral exposure, liver CAT activity was recovered. These differences, after ip or oral exposure, in the enzymatic activity could be related to the toxicokinetic of glyphosate (mainly, the route of administration), as well as to the different experimental designs in terms of exposure time. Like any other chemical compound, glyphosate has a particular kinetic depending on the chosen route of administration. Intraperitoneal administration has a rapid and almost complete absorption, and provides a high bioavailability of the administered compound, whereas in oral administration the bioavailability is lower probably because the gastrointestinal absorption rate mostly depends on the physical and chemical characteristics of the administered compound. According to previously reviewed toxicokinetic studies (Williams et al., 2000) glyphosate has a poor gastrointestinal absorption. The oral bioavailability, according to various authors, varies between 19% to 36% (Anadón et al., 2009). We may assume that the ip administration of 400 mg/kg of glyphosate resulted in a relatively high plasma concentrations of the herbicide in a short period of time, followed by the generation of ROS, which led to an increase in the hepatic activity of SOD and catalase. It is also possible that when glyphosate and AMPA were orally administered, a compensatory increase in SOD and CAT activity occurred due to ROS increase, followed by a decline in the levels of SOD and CAT until normalized levels over the course of days, and even fell below the control group levels in those animals exposed to 100 mg/kg of AMPA. Langiano and Martinez (2008) and Modesto and Martinez (2010) also reported temporary alterations in SOD and CAT hepatic activity in fish, with a compensatory effect of ROS levels by enzymatic activity. This was clearly observed in CAT and SOD determinations in our study in mice liver. The activity of both enzymes was higher in the previously ip administration design (Mañas et al., 2009b) compared to the current design of oral administration of glyphosate at a dose of 400 mg/kg (Figure 1). This suggests that enzymatic activity could be normalized once ROS are removed; therefore the imbalance (oxidative stress) between ROS and antioxidant systems is corrected. Other authors have reported an increased lipid peroxidation in liver tissue of pregnant rats and their fetuses exposed to glyphosate, which demonstrates the potential of this herbicide to cause oxidative stress in vivo (Beuret et al., 2004). To our knowledge, there are no published results related to the evaluation of AMPA as a possible inducer of oxidative stress, and no biological difference was detected in the assayed dose. The single cell gel electrophoresis assay (comet assay) is a sensitive technique used to measure DNA damage in individual cells, and has been used both in vitro and in vivo to identify potentially genotoxic compounds of environmental use (Sasaki et al., 2000; Moller, 2006). In the genotoxicity results obtained in the comet assay in blood in the present study, significant differences were determined between the three treatments and the control group in tail intensity, length and moment. Regarding the similar statistical significance in these three parameters evaluated (p <0.0001) in almost all the groups, the higher absolute values were found in the G400 treatment. It can be observed that tail moment values in the comet assay were similar for both glyphosate and AMPA treatments. This allows us to affirm that the scientific community concerned about the genotoxic effects of environmental xenobiotics should be worried about AMPA as much as glyphosate. Using the comet assay and an also in vivo design, Bolognesi et al. (1997) reported DNA damage in liver and kidney of mice exposed to glyphosate at 300 mg/kg by ip route. In a previous work in Balb C mice and after 1 hour of ip exposure to glyphosate at 400 mg/kg, we found a statistically significant increase in the percentage of genetically damaged blood cells (98.0 ± 1.1) (Mañas et al., 2006). The top or maximum tolerated dose recommended for in vivo genotoxicity assays is the dose such that higher dose levels, based on the same dosing regimen, would be expected to produce lethality. In multiple administration studies, a limit dose of 1000 mg/kg is used for 14 days or longer studies; if this dose is tolerated, it is recommended (ICH, 2012). This also means that recommended doses for genotoxicity testing are not related or calculated on the basis of environmental concentrations, not even for human or animal exposure. On the other hand, these are very scarce data in the literature regrading this point. In balb C mice we have previously observed lethality in preliminary studies using doses above the employed in the present work. Some authors have discussed the role of the oxidative stress as a mechanism of action of some pesticides (Astiz et al., 2009). Antioxidant defense mechanisms, including SOD and CAT, have a considerable importance because they are involved in protection against free radicals produced during oxidative stress. In this study, we have detected genotoxic changes in G40, G400 and A100 treatments; however, significant changes in the levels of SOD and CAT especially in heart and kidney were only caused by G400 exposure. This let us to suppose that the genotoxic effects of glyphosate and AMPA are much more important than the indicators of oxidative stress, therefore the latter does not seem to be related to the genotoxicity observed. To our concern, the more relevant results of this study are those that demonstrate alterations that suggest genotoxicity in mice exposed to AMPA. Moreover, previously we have reported that AMPA induced genotoxic effects in all the assays performed: chromosomal aberrations, comet assay in Hep-2 cells and micronucleus test in mice (Mañas et al., 2009b). Results from the present study provide the bases for future research using a broader number of doses of AMPA to assess oxidative stress and genotoxicity. Despite the fact that little is known about AMPA biological activity, regulatory agencies have determined that it is not of toxicological concern and, therefore, it is not included in risk assessments (EPA, 1993, WHO, 1994). However, our results from genotoxicity assays indicate that AMPA is a metabolite of risk from the toxicological point of view. AMPA residues, as well as glyphosate, are found as contaminants in the environment (Botta et al., 2009, Hanke et al., 2010; Schriks et al., 2010). In this work we explored oral administration because is one of the most expected routes to glyphosate and AMPA exposure, besides the respiratory and dermal. We affirm that more sub-acute and sub-chronic studies need to be performed. Williams et al. (2000) concluded their glyphosate review by stating that under the present and expected conditions of use, there is no possibility that this herbicide may pose a risk to human health. However, recently, other authors have reported some conflicting results (Isenring 1996, Bolognesi et al,. 1997; Lioi et al., 1998a, 1998b; Monroy et al.,. 2005). Results from our studies suggest that both compounds (glyphosate and AMPA) should be re-examined in the light of changes in the present conditions of use: larger volumes than those used ten years ago and in larger areas of land cultivated with transgenic crops, resistant to glyphosate. Both compounds can interact with DNA, causing deleterious effects on genetic integrity or genomic functions. There is evidence that with the present and future conditions of glyphosate use, both compounds will be appearing as pollutants in soil and water and also as residues in food; therefore, more studies are necessary to evaluate the biological effects of these pollutants on animal, human and environmental health. This study was supported by Consejo Nacional de Investigaciones Científicas y Tecnológicas (CONICET) and Secretaría de Ciencia y Tecnología, UNRC (Universidad Nacional de Río Cuarto), Argentina.